Since announcing last week that I was back to watching what I ate, and logging my meals on myfitnesspal.com I can announce that I lost 1lb. I was fully expecting more. And when I got on the scales I was all geed up to write isn't this an amazing thing. All I did was cut back on blah and ate more of bleugh. I'm not feeling that I can do that. I did have the quiche bites as a snack. I've moved to eating more regularly. A little something every 2-3 hours. I didn't manage to move much this week at all. This is the reason I didn't lose more. Sadly most of my day is spent sitting on my bum typing and reading, and due to illness and work I didn't get to do my usual evening activities and spent most of it again either sat on my bum or sleeping. Oh what an exciting life I lead. My Fitness goal for this week is to walk 5k steps per day. This is much more than I do at the moment. I will be working towards the magic number of 10,000 steps per day by the end of October. 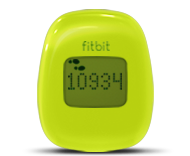 To help me with these goals I have bought myself a Fitbit Zip Activity Tracker. It is a digital pedometer that you can use in conjunction with other apps and record your steps, once you sync it with either your phone or the website and input your personal data it will calculate how many calories you burn just sitting as well as during the exercise that you are partaking in. What I like about the Zip above some of the other products fitbit have to offer is the simplicity. Out of it's holder it is roughly the size of a 50p. There are no buttons to catch, or accidentally reset. I also like that the clip means you can choose where you wear it. Either on your waistband or trouser pocket like with a regular ped. Or on the bra. I'm loving the bra wearing myself. It's discreet, you can check on it and your progress quiet easily without wrenching about and adding extra steps to it. Although I reckon a few looks could be given if I decide to check in the car park at the office... must remember that windows are see through. Saturday was my first day wearing it, and in the afternoon and up until bedtime, I only did 1,953 steps. This is why I decided to get this little device. A little something that means I can track how much exercise I am sneaking in during the day. Especially on a busy shift in the office where I don't get to move away from my desk, I am hoping that it will gee me into some extra action, and a bit of competition with myself too. I also like that I can earn badges for the weight that you lose, which is about the only thing I that I do miss from going to weight loss groups, the shiny stickers and the mid week gee up that a pep talk from someone else managed to give you. You can also log your food, sleeping patterns, different activities all on the interactive Fitbit website. Which also has a comprehensive help section and forums too. I got mine in green from Amazon for £32.28 - however the prices vary wildly, seemingly dependant on the colour you want. Or from Fitbit for £49.99. Beware: whinging and moaning is par for the course on that profile.